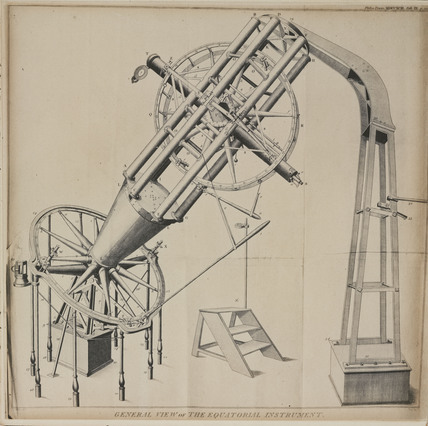 Print of the telescope installed in 1791 at the private observatory of Sir George Shuckburgh (1751-1804) in Warwickshire, England. Titled 'General View of The Equatorial Instrument', the engraving shows a refracting telescope of 4 inch aperture on an equatorial mounting. Built by Jesse Ramsden (1735-1800), the foremost London instrument maker, it was intended as a measuring instrument. Later in 1811, it was presented to the Royal Observatory, Greenwich where it was little used due to the instability of its mounting. After many years of inactivity the instrument was presented to the London Science Museum In 1929.